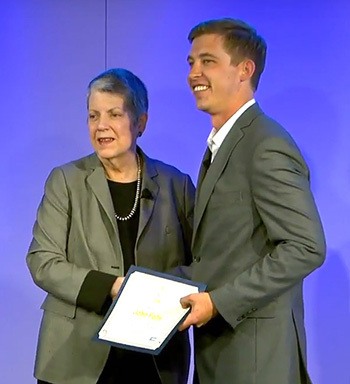 John Felts with UC President Janet Napolitano at the UC Grad Slam competition. John Felts, a graduate student in electrical engineering at UC Santa Cruz, placed second in the 2017 UC Grad Slam competition, held Thursday, May 4, at LinkedIn’s downtown San Francisco office. Felts advanced to the finals after winning the UCSC Grad Slam with his presentation on Cruz Foam, a biodegradable alternative to the polyurethane and polystyrene foam used in surfboards. Working with Marco Rolandi, associate professor of electrical engineering, and graduate student Xiaolin Zhang, Felts developed a way to use chitin, a natural polymer found in shrimp shells, to make a sustainable foam product. Grad Slam is a three-minute elevator pitch competition to encourage better storytelling about complex academic topics. UC’s Grad Slam program provides real-world job preparation by encouraging students to better communicate the potential impact of their research, a critical skill for emerging scientists and scholars as they seek to engage the public — and potential employers — in their work. More information about the Grad Slam event, including video of the presentations, is available at gradslam.universityofcalifornia.edu.